As powerful as it is graceful, the Silvercraft 36 HT is a perfect example of innovation. 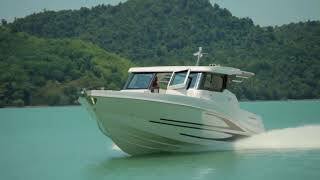 The modern shape, unmistakeable style, and ample floor space make it the ultimate boat to have. This hard-top boat is built for fishing, coastal or on the open sea. Its overall layout is designed to keep its owner out of the sun and protected from the rain while still offering panoramic views of the sea.